How do I get from here to there in minutes? AutoPREP easily and systematically accomplishes the tedious tasks of locating, editing and removing unwanted and unneeded entities throughout the entire drawing in just minutes! LET’S START WITH THE POWERFUL BLOCK EDITORS! Blocks usually make up a large portion of the drawing and prove the most difficult to edit, especially when they contain both needed and undesired entities. AutoPREP contains several block editing tools to rapidly identify and remove entire blocks or just portions thereof. The “Single Edit” mode offers a user friendly process to view and remove all undesired blocks. The user can tile-through the entire list of blocks that are sorted in descending order of magnitude displaying the quantity of each contained throughout the drawing. Choosing delete will remove it and all like blocks in the drawing regardless of block affiliation or nesting. The “Multi-Screen Editor” accelerates this process by displaying multiple blocks simultaneously on a separate viewing screen also sorted by unit count in descending order. Easily isolate multiple unneeded blocks for deletion using CTRL, SHIFT, or WINDOW selection methods. In just minutes, hundreds of undesired blocks and nested blocks can be removed globally. These editors work incredibly well for viewing and deleting entire blocks, however blocks often contain vital elements, prohibiting deletion of the block as a whole. Until now, deleting portions of a block required “exploding”. This process often compounded the cleanup process by increasing the number of unwanted objects breaking them into simple DWG elements or additional blocks that were previously nested. AutoPREP’s amazing “GLOBAL BLOCK EDITOR” can reach into blocks to remove, individual elements without exploding! Choose “BLOCK” to select entire nested blocks or “CLIP” to “cut out“ any undesired elements within the block. Edited portions of blocks or the nested blocks within will change all instances of the block occurring throughout the drawing as displayed in the summary block count dialog. The dynamic editor functions on all drawing elements not just blocks to easily wipe clean entire drawing areas while globally removing all like components. 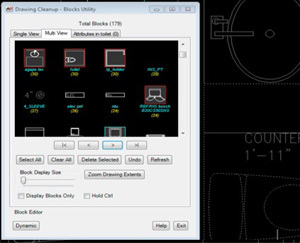 These utilities work similar to the block editors allowing for user friendly "tile- thru" viewing and editing with individual unique capabilities. “Hatch Editor” - Hatches can be a big contributor to redundant clutter and wasted space in the drawing. The vast majority are either diagrammatic or decorative and are non-essential. As the user scrolls through the list in the hatch utility, AutoPREP pans to each hatch in the drawing. Edit or delete hatches individually or globally, with the touch of a button. “Text Utility” - In addition to pan thru editing, easily convert complex Mtext to simple text, edit text style, change font and size, and more! “Layer Utility” - Display drawing layers in alphabetical order or in descending order of entities cont ained on each layer. Allows focus on the layers with greatest contribution to the drawing file size. AutoPREP also allows layers to be protected so that nothing is changed by AutoPREP on a protected layer. Clicking any entity on the drawing selects that object's layer in the layer utility display, setting the stage for deletion or merging to a new layer. AutoPREP’s “Drag and Drop” simplicity allows the user to organize the drawing layers and greatly simplify the DWG in just minutes. And much more! The AutoPrep Layer Cleanup Utility gives you the option of displaying all DWG layers in alphabetic order as well as descending order of the number of entities contained on each layer. This helps you focus on the layers which have the greatest contribution to the DWG file size. AutoPrep allows you to mark layers as "protected" so that nothing is changed by AutoPrep on a protected layer. Selected layers can be merged to a new layer with the option of shutting off the layer that is the source of the merge. Layer merge and layer delete commands can be applied to layers within all block references on the drawing. AutoPrep Layer Utility displays the results of any layer merge that has been performed. AutoPrep allows for superior analysis to the AutoCad Layer manager by providing single click drawing isolation which provides easy visual analysis of all layer content. One or more selected layers can be isolated on the drawing with a single click. After analysis has been completed, a second click restores the previous view. Clicking any entity on the drawing selects that object's layer in the AutoPrep Cleanup utility display setting the stage for deletion or moving the layer's contents to a new layer. These features allow for immediate recognition of each layers content and ease of editing for unified relevance and organized cohesiveness. Hatch Patterns, especially visually dense hatches, can considerably tax system resources related to drawing size. 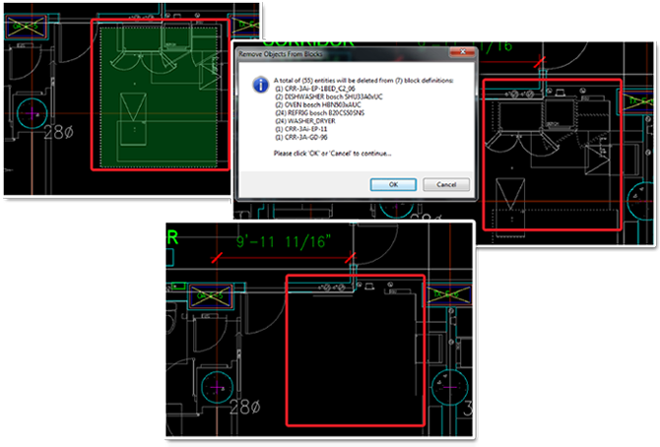 While some may be important to understand the drawing layout, others are not and can greatly reduce the performance of the drawing in AutoCad. 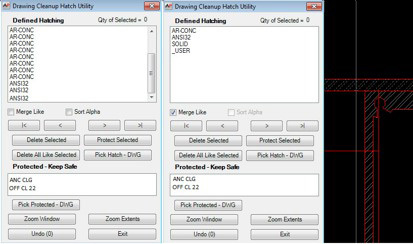 The AutoPrep Hatch Cleanup Utility offers capabilities that are not presently offered by AutoCad. Every hatch pattern is listed and grouped in one of several ways to meet your drawing preparation needs. Hatches can be sorted alphabetically, sorted by number of times they’re used on the drawing or consolidated to a single hatch for ease of deletion. Drawings with a particularly large number of hatches are best viewed with a single representative of each hatch for a high level view of what’s on the drawing. Even the largest of drawings can be analyzed from this list. Counts are included with each so the hatches taking up the most space on your drawing are on the top of the list. Once a high level perspective has been seen, you can change to single view where each hatch on the drawing is listed. In this view, the selected hatch is zoomed to for your analysis. With just a few clicks you will have a clear knowledge of how and where each hatch is used. Deletions can be made to individual hatch instances or to all like selected or the condensed single hatch; all of this without a crosshair or pick box. The AutoPrep Text/MText Cleanup Utility puts all written notes from your drawing into convenient lists; one for MText and one for Simple Text (Text). This perspective eliminates the panning and zooming usually required for determination. Text/MText cleanup lists every instance of these entities on your drawing so you can scroll through the list to see if each is relevant for your design. In the same way as in the other cleanup utilities, as each is selected from the lists, AutoPREP zooms to its location on the drawing. This adds extra perspective for your analysis as to whether you need to keep it, or delete it directly from the Text/MText utility. In addition to the power of the interactive analysis, the Text/MText Cleanup utility provides the capability to convert MText to “Simple” Text. M/Text is extremely resource intensive and his feature alone can greatly reduce the overhead of the graphic styling of MText. Read it, reduce it or delete it and you are on to the next automated preparation feature. 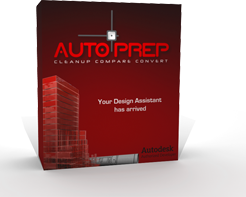 AutoCAD users will find AutoPrep’s Block Cleanup feature the most amazing of all the cleanup tools and beyond their wildest dreams. Imagine selecting an undesired nested block within a block and have the ability to remove it without exploding anything. Now try to imagine that same entity being simultaneously removed globally throughout the drawing. That’s exactly what AutoPREP’s dynamic block editor is capable of and so much more. There are four editing tools within the routine that starts with a single edit review similarly to the other cleanup utilities. A list of all the blocks in the drawing is provided in order of magnitude, most to least, with a clearly defined entity count. Each selected block is zoomed to on the drawing for analysis of how and where each is used and can be kept or deleted. 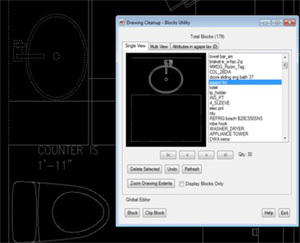 To expedite the process, a multi-view screen viewer is available with counts displayed allowing the user to select multiple blocks at once with the standard windows selection tools set. ie: Ctrl, Alt, Window and Crossing Window. In addition, the "zoom to" selection also provides an isolated view image of the selected block making it even easier to know exactly what each block includes. This is true even when they are nested many times within other blocks. AutoPREP’s amazing “GLOBAL BLOCK EDITOR” can reach into blocks to remove embedded hatches, text, nested blocks, and more. Again, without exploding! Choose “BLOCK” to select entire nested blocks or “CLIP BLOCK” to “cut out” only the undesired elements. Edited portions of blocks or the nested blocks within will change in all instances of the blocks occurring throughout the drawing. Right clicking will display a summary of elements and block counts affected. The global editor functions on all drawing elements not just blocks to easily wipe clean entire drawing areas while globally removing all like components. It just doesn’t get any better or easier than that!